In a virtual career fair, companies and job seekers can connect in a virtual environment. These online job expos have become increasingly popular. But how is a virtual career fair different from an online job board? The answer to that question can really vary, from not at all to completely different. Read on to find answers to that and more questions about attending a virtual career fair. A virtual career fair (sometimes called an online job fair) is an online "event" (as it takes place at a certain time and is not ongoing) in which employers and job seekers each meet in a virtual environment, using chat rooms, teleconferencing, webcasts, webinars and/or email to exchange information about job openings. 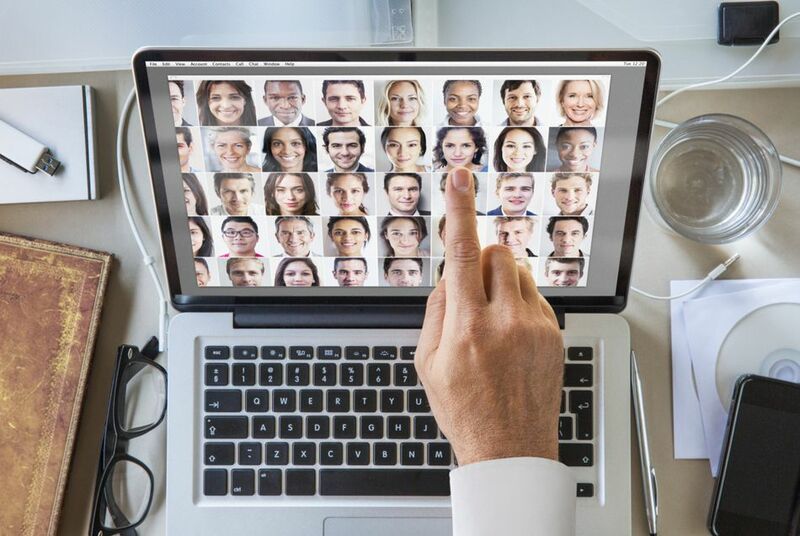 Job seekers upload resumes and may be matched with employers or may simply browse companies’ “booths.” Like a non-virtual job fair, a virtual job fair has a limited duration. Does a Virtual Job Fair Only Have Remote (Or Work From Home) Jobs? No. In fact, depending on the employers participating, it may have very few work at home jobs. However, the fact that a virtual career fair may target no particular, or a very large, geographic area can be an advantage for employers seeking remote-based employees. A virtual job fair may receive job seekers from all over the country or the world, so companies only looking for employees near their locations may have to eliminate qualified candidates due to location. A company seeking employees to work from home would have fewer geographic restrictions. Who Sponsors Virtual Career Fairs? Many different organizations might host a virtual job fair. Often they are hosted by the same groups that might sponsor a non-virtual job fair, such as colleges, trade associations, state employment agencies, veterans organizations, etc. A group might choose to host a virtual career fair because it costs less or it might host one in conjunction with a real-world job fair. However, other organizations such as online job boards or companies that specialize in Internet-based recruitment might also sponsor a virtual career fair. Sometimes companies might dub an online recruitment event as a “virtual career fair,” but because there is only one employer it isn’t really a fair. What Kind of Jobs Are Available at Virtual Career Fairs? Almost any kind that is in a non-virtual job fair. Like real-world job fairs, a virtual career fair may be focused on a certain industry, profession, or geographic area. There are virtual job fairs for veterans. If it is sponsored by a college, it may be geared toward recent college graduates. Companies that participate in virtual job fairs usually have multiple openings and locations. Virtual career fairs run the gamut. They might just be simple websites with lists of employers and links to their websites or "booths." However, some feature elaborate virtual environments set to look like a real-world career fair with a map of a fictional convention center and links to company pages that feature graphics of booths. These often have chat rooms and video presentations. A virtual career fair may offer resources for job seekers, such as resume tips, career quizzes, or videos about how to present yourself in an interview. Companies’ booths may provide a wealth of information on the companies or they may simply host links to their websites and a list of job openings. Much of the information at a virtual career fair can be digested at the jobseekers own pace. However, there may be chat times, webinars, or online presentations at specific times. Like a non-virtual career fair, you will likely register upon entering, uploading a resume and often filling out a questionnaire about your interests and experience. The career fair may generate a list of employers that match your skills. You may use that list or browse the companies. Most virtual career fairs have a way to search the participating companies’ job openings, either all together or at each company’s booth. At each company’s booth, there may be an opportunity for personal contact, such as a chat room, or you may be able to leave your resume or email the company. How Much Does a Virtual Career Fair Cost? They should be free to job seekers. Be wary of any that charge a fee or pitches job-seeking services for a price; they are likely scams.